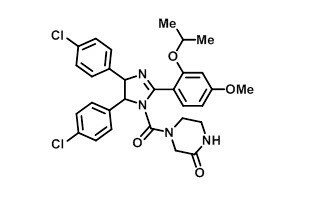 Relevance MDM2 inhibitor Nutlin-3 potently inhibits the MDM2-p53 interaction, leading to the activation of the p53 pathway. Loss of p53 activity, by deletion, mutation, or MDM2 overexpression, is the most common event in the development and progression of cancer, while the restoration of endogenous p53 function results in tumor regression in vivo. In this context, the rescue of the impaired p53 activity and resensitization to apoptosis in cancer cells by disrupting the MDM2−p53 interaction offers an opportunity for anticancer therapeutics. Nutlin-3 is a wild-type p53 activator which acts by binding and inhibiting MDM2. In vivo applications Oral administration of Nutlin-3 at 200 mg/kg twice daily for 3 weeks significantly inhibits the tumor growth of SJAS-1 xenografts by 90%, comparable with the effect of doxorubicin treatment with 81% inhibition of tumor growth. In vitro applications Nutlin-3 potently inhibits the MDM2-p53 interaction, leading to the activation of the p53 pathway. Nutlin-3 treatment induces the expression of MDM2 and p21, and displays potent antiproliferative activity with IC50 of ~1.5 μM, only in cells with wild-type p53 such as HCT116, RKO and SJSA-1, but not in the mutant p53 cell lines SW480 and MDA-MB-435. In SJSA-1 cells, Nutlin-3 treatment at 10 μM for 48 hours significantly induces caspase-dependent cell apoptosis by ~45%. Although Nutlin-3 also inhibits the growth and viability of human skin (1043SK) and mouse embryo (NIH/3T3) with IC50 of 2.2 μM and 1.3 μM, respectively, cells remain viable 1 week post-treatment even at 10 μM of Nutlin-3, in contrast with the SJSA-1 cells with viability lost at 3 μM of Nutlin-3 treatment. Nutlin-3 does not induce the phosphorylation of p53 on key serine residues and reveals no difference in their sequence-specific DNA binding and ability to transactivate p53 target genes compared with phosphorylated p53 induced by the genotoxic drugs doxorubicin and etoposide, demonstrating that phosphorylation of p53 on key serines is dispensable for transcriptional activation and apoptosis. Although binding less efficiently to MDMX than to MDM2, Nutlin-3 can block the MDMX–p53 interaction and induce the p53 pathway in retinoblastoma cells (Weri1) with IC50 of 0.7 μM. Nutlin-3 at 30 μM also disrupts endogenous p73-HDM2 interaction and enhances the stability and proapoptotic activities of p73, leading to the dose-dependent cell growth inhibition and apoptosis induction in cells without wild-type p53.